Anyone else dreaming of spring yet? I think it’s at this time of year that many folks are starting to get just a bit tired of winter. Especially if you live in one of the blizzard states. After shoveling snow for weeks and having to work and drive in it, I’m sure a sunny warm day is calling your name. 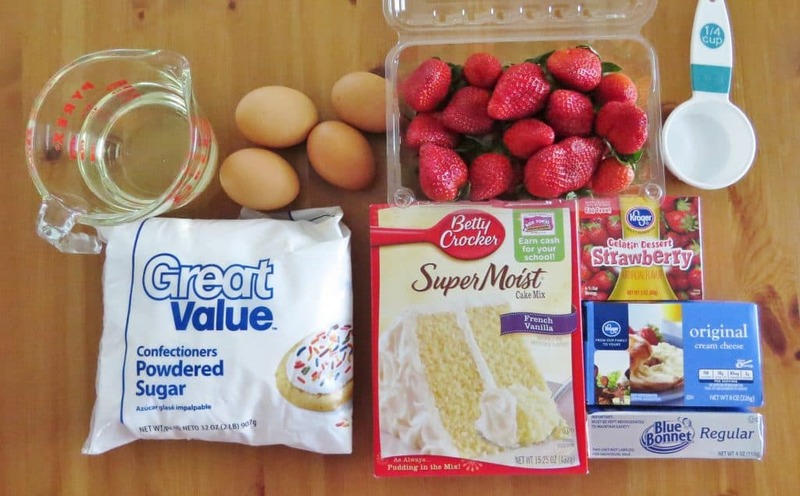 So in honor of the coming spring (because it will eventually come, I promise), I’m making a strawberry cake. That beautiful, juicy fruit that is oh so tasty and ripe during those first warmer months of the year. 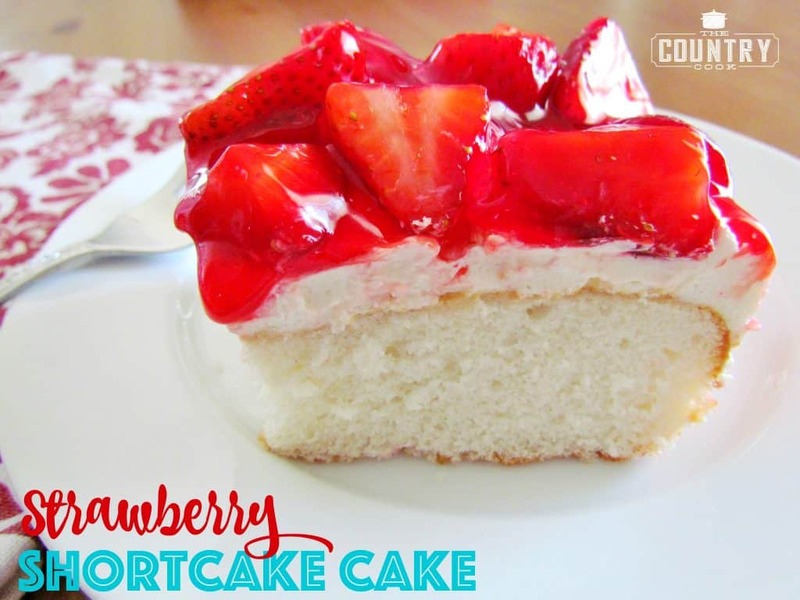 For this recipe, I’m using my favorite Fresh Strawberry Cake recipe from Duncan Hines. It’s an old favorite and it has never failed me. 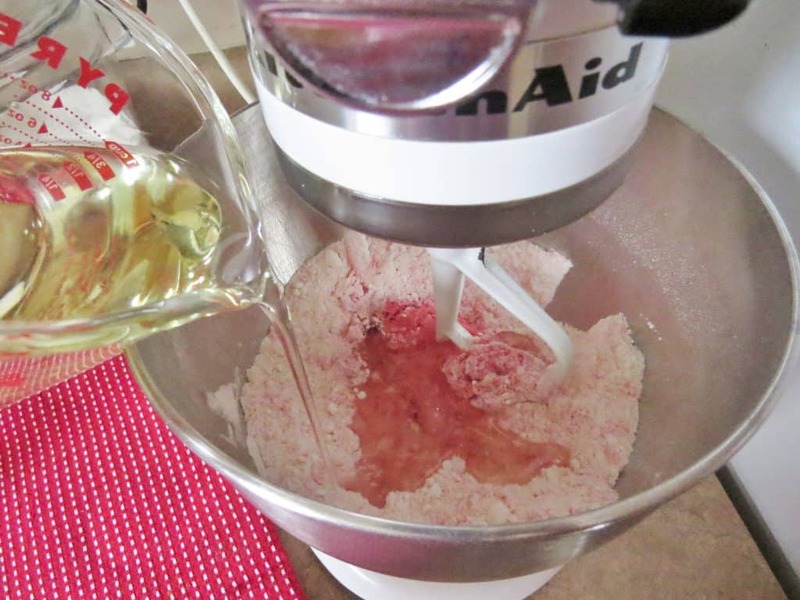 And I’m using my go-to cream cheese frosting recipe that I like to use for my Red Velvet Cheesecake Cake. It really is the perfect frosting for this cake! Preheat oven to 350F degrees. 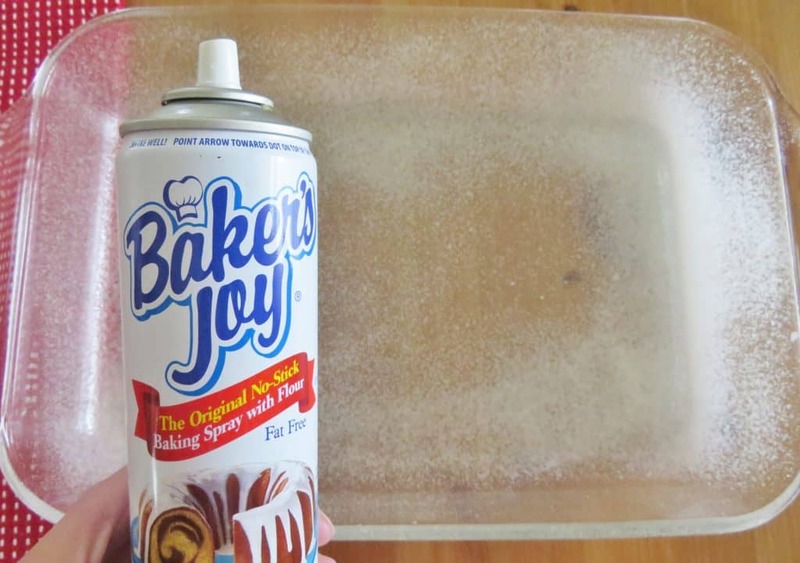 Spray 9×13 baking dish with nonstick cooking spray. Y’all know I love this kind that has flour in it. Perfect for baking. Give your strawberries a good rinse then gently dry them with a paper towel. Remove the stems and dice them up. 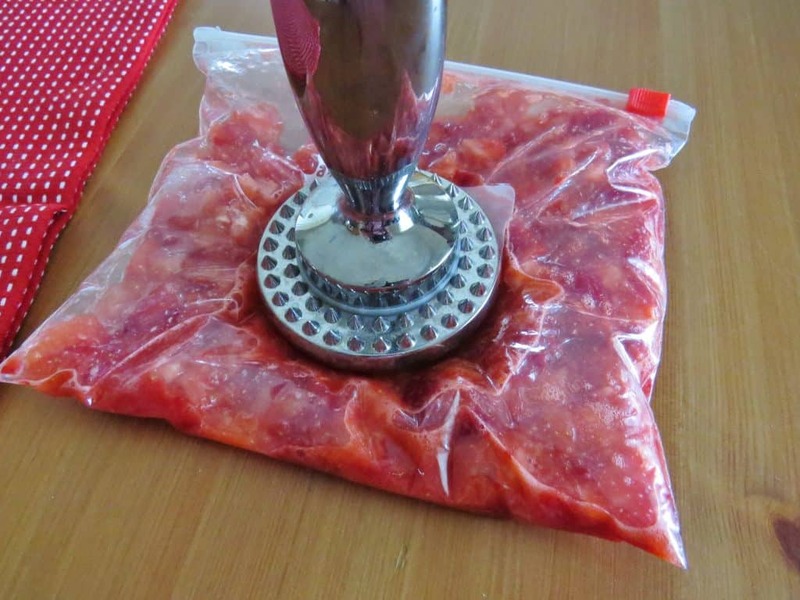 Then stick them in a plastic Ziploc bag and start crushing them up.I’m using the flat side of my meat tenderizer here but you can use any heavy object or a rolling pin. This will probably take you a minute or two. 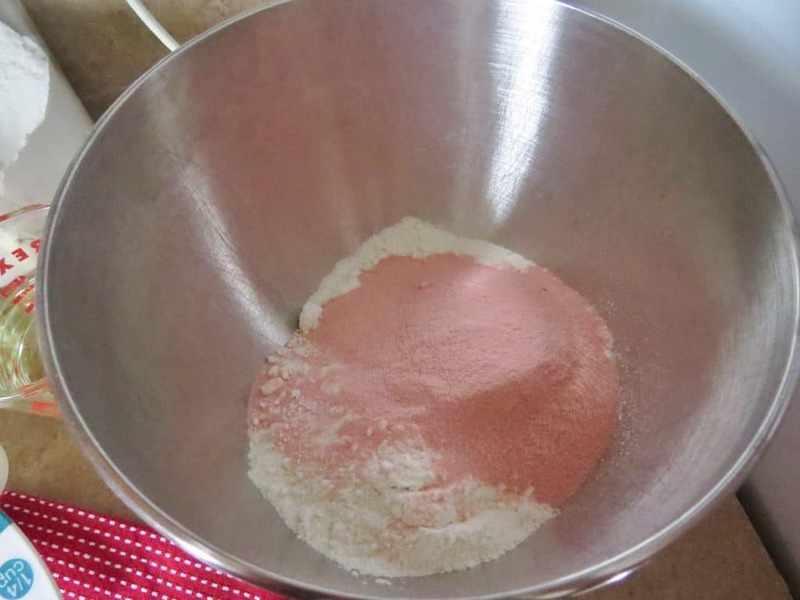 In the bowl, combine cake mix with strawberry gelatin powder. Mix until combined. Then stir in your oil, eggs and water. Once that is combined, add in 1 cup of your smooshed strawberries. You will want to gently stir those in by hand. Then pour batter into baking dish. Bake for about 30-33 minutes. Oven times do vary, so to make sure it is done, stick a toothpick in the center, if it comes out clean, it is good to go. Allow cake to cool completely before adding frosting. 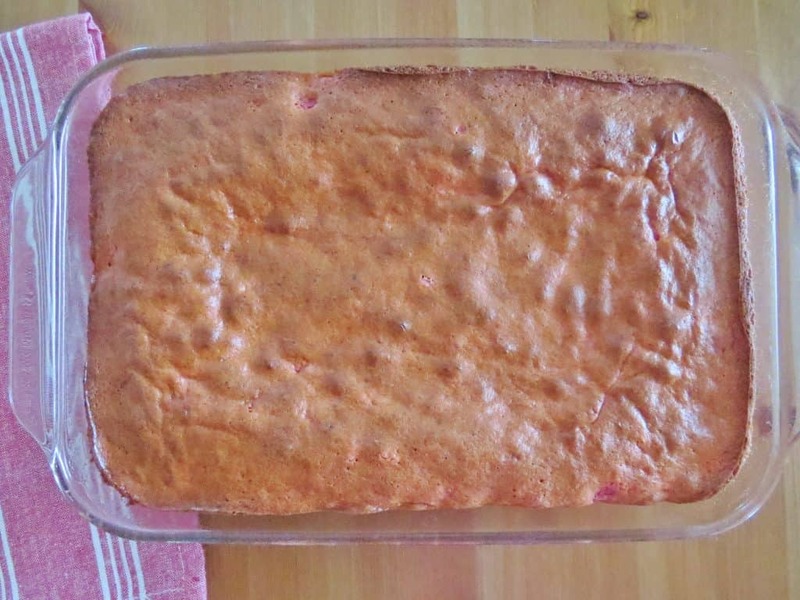 If you’ve ever made a strawberry cake before, you know they always brown a bit on top. No worries, that is normal. We are gonna cover it up with frosting anyway. 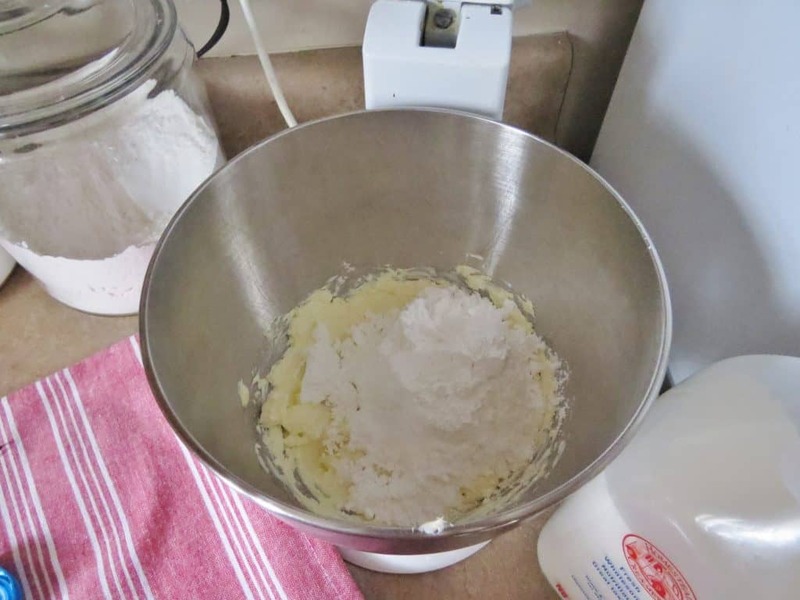 To make the frosting, mix together your softened butter and softened cream cheese. It’s easiest if you have an electric mixer. Mix until smooth and creamy and lump-free. Then mix in powdered sugar, vanilla extract and milk. Mix until smooth and creamy. 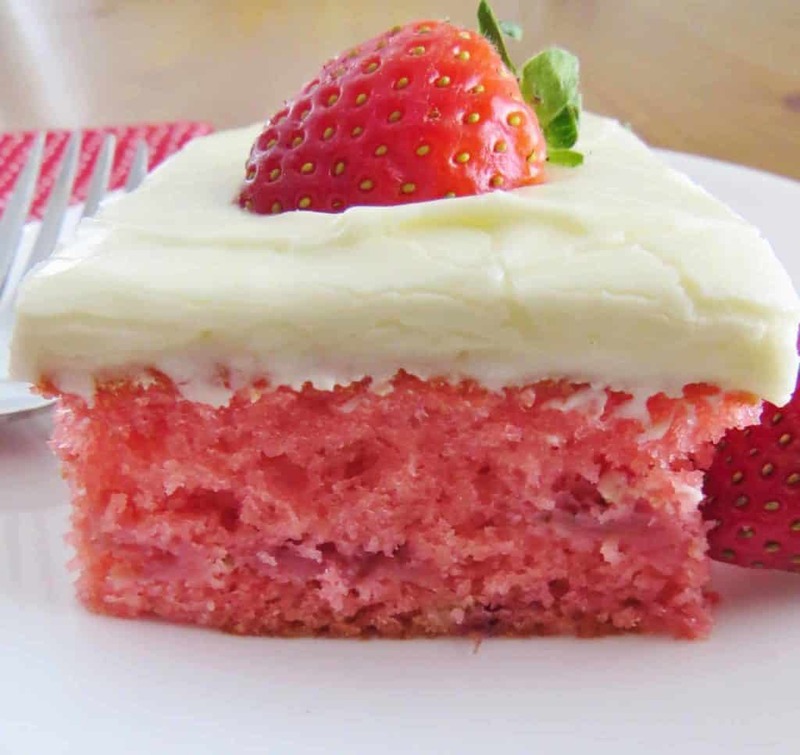 Note: If you have any leftover crushed strawberries, you could always add it to your frosting. Slather frosting onto cooled cake. Then slice and serve. If there are any leftovers, you’ll want to cover it and put into the fridge. Spray 9 x 13 baking dish with nonstick cooking spray. 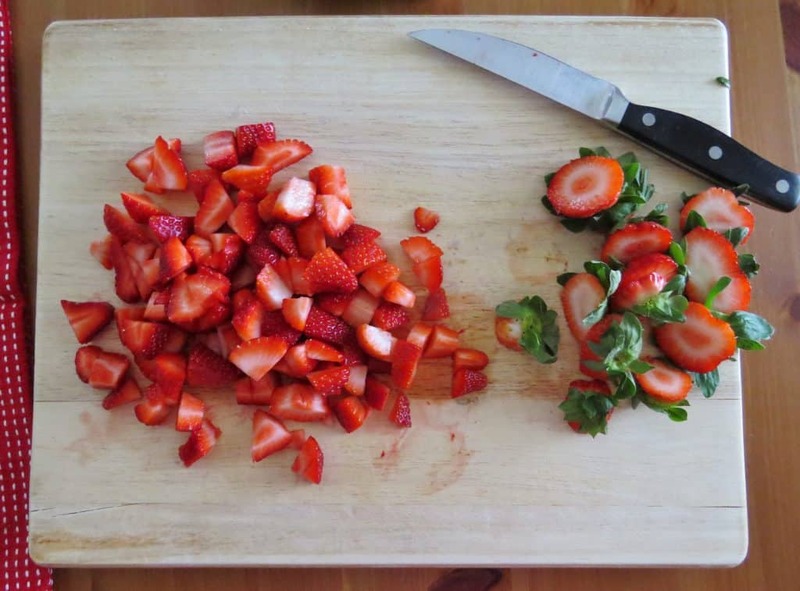 Give your strawberries a good rinse then gently dry them with a paper towel. Remove the stems and dice them up. Then stick them in a plastic Ziploc bag and start crushing them up using a rolling pin or other heavy object. This will probably take you a minute or two. 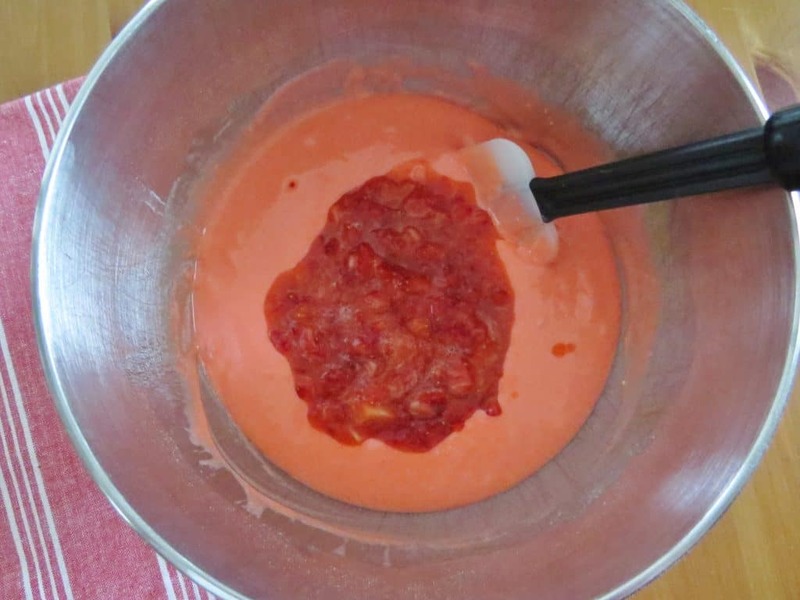 In the bowl, combine cake mix with strawberry gelatin powder. Bake for about 30-33 minutes. Oven times do vary so to make sure it is done, stick a toothpick in the center, if it comes out clean, it is good to go. 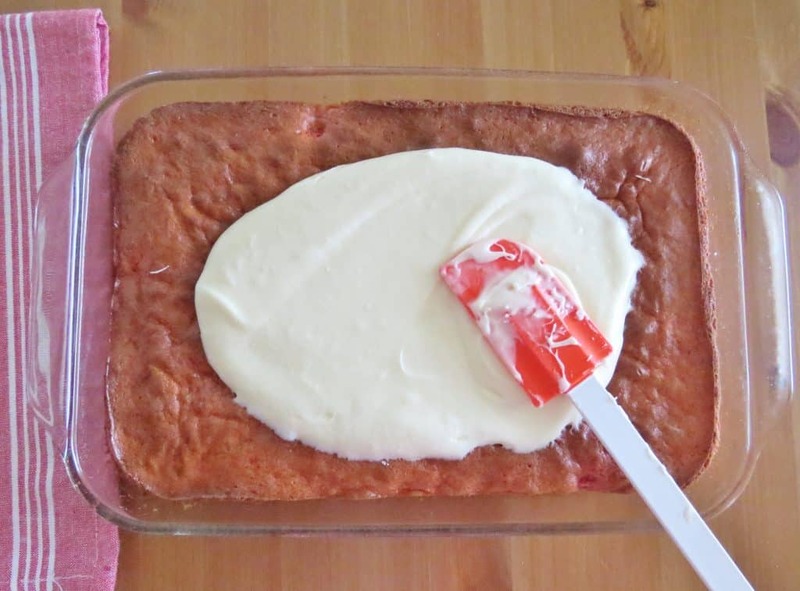 Allow cake to cool completely before adding frosting. 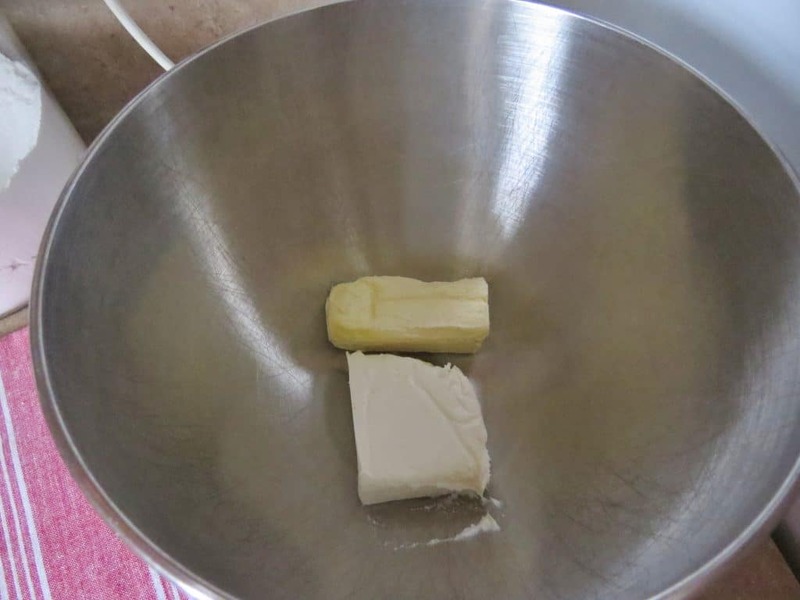 To make the frosting, mix together your softened butter and softened cream cheese. It's easiest if you have an electric mixer. Mix until smooth and creamy and lump-free. Then mix in powdered sugar, vanilla extract and milk. Slather frosting onto cooled cake. If there are any leftovers, you'll want to cover it and put into the fridge. If I use a white cake mix do I use all the eggs or just the whites. I've made this cake twice now and it is absolutely delicious!!! Would highly recommend – my friends have been begging me to make it again for them! Just curious if you can substitute the water for buttermilk? Thanks i will give this a try. It is very similar to a recipe i just used. Just made these as cupcakes with my godsister today. Substituted the oil for butter and the water for milk. Turned out great and the fresh strawberries were perfect! Posted pictures on facebook and one of my neighbors came and picked up few since we had so many. Could I use a bundt cake for this recipe bad just drizzle the frosting over it? 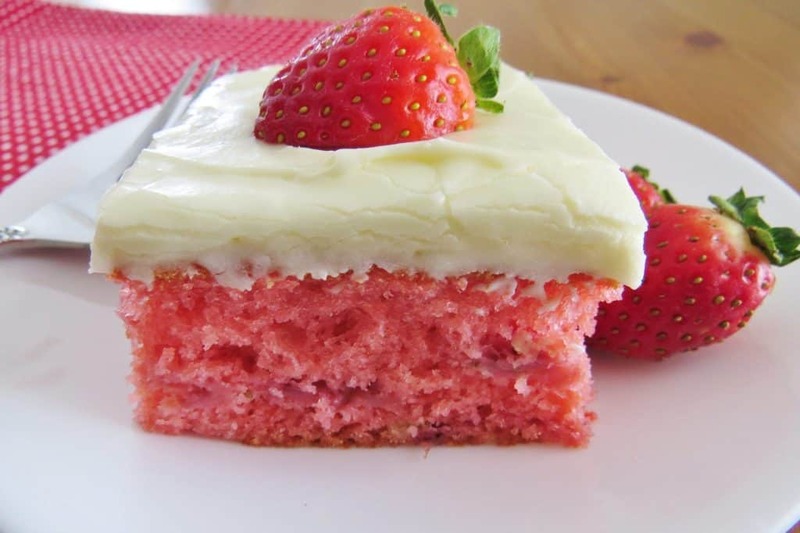 I'm going to make this as a birthday cake….it looks so yummy. This would be great for cupcakes too! I usually use applesauce in recipes that call for veg. oil. Can i Use applesauce with this recipe or will the applesauce and the strawberries together in the mix make it too runny? I have not used applesauce in this recipe so I can't say for sure. I have used applesauce in other recipes with great success. If you try it this way, make sure you come back and let me know how it turned out for you. Follow this recipe and use the 4 eggs. Can you make and freeze for later? This one disappears so fast I never have to worry with freezing but I think you could. Make sure you wrap it very tightly. Instead of jello can I use strawberry extract? I have never made it that way so I can't say for sure. If you try it this way, come back and let us know how it turned out for you. Loved this cake and will make it again. 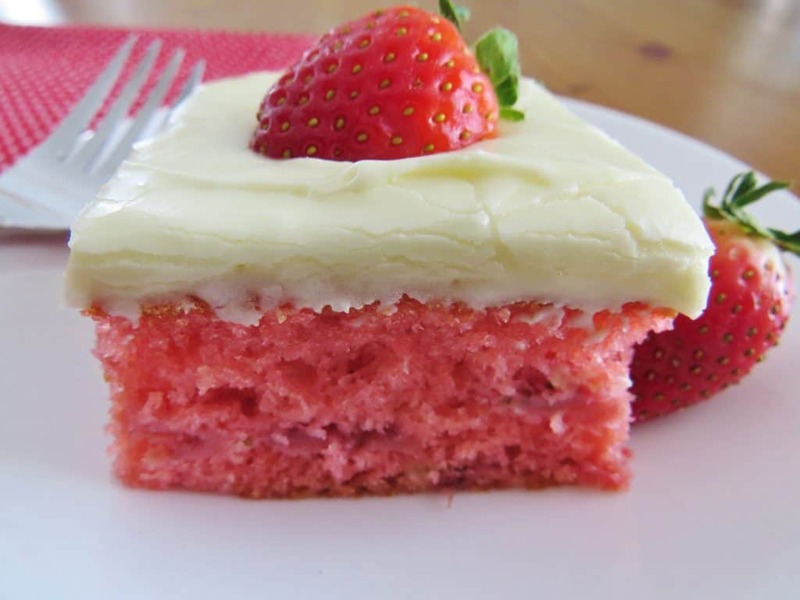 I added strawberries to the icing and added a little to much so it was a little runny but AMAZING!!! Thank you! Can this recipe be made in two round cake pans instead? I’m wanting to do a layered cake for my friend’s birthday. I have made this cake about 14 times. I have also varied the recipe to make an “Orange Dream” cake. Replace the strawberry gelatin with orange flavored jello and replace the strawberries with mashed peaches (still fresh or frozen, no sugar added).. Delicious! You can replace any flavor of gelatin and any fruit that has about the same moisture/texture. Love it Kate!! And thanks so much for letting us know how it turned out with other combinations!! Can you tell me how long to bake it if I’m using a bundt pan? This cake is my favorite!! It is too simple!!! Today on my mother’s birthday, we made this cake. It was very delicious!!!! Everyone loved it! This cake was good, but it was really rich. The icing was delicious and sweet probably making it rich. I had to bake mine a little longer, the middle of the cake was slow getting done. I had to go back to the recipe on the web site to figure it out. 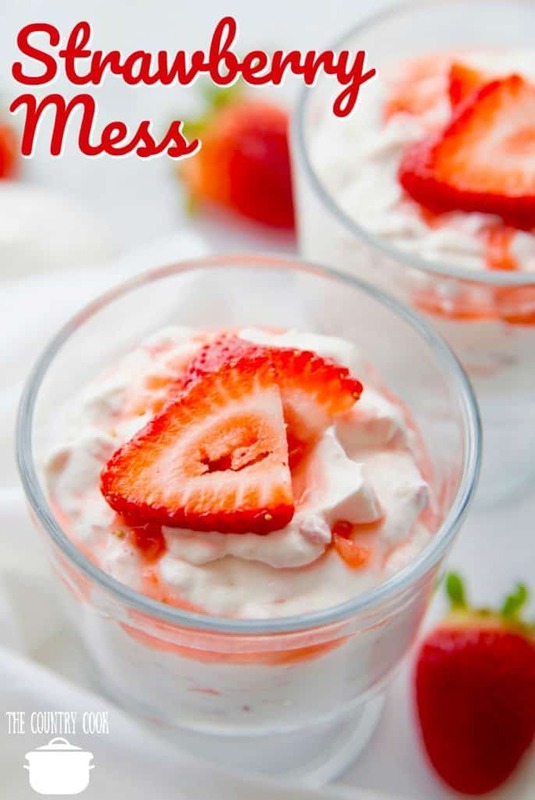 This recipe looks fun –I just wish it used more strawberries. I can’t keep up with the ones coming out of my garden. I have made about 6 of the cakes since I found this recipe and it is so good. My friends say that it is the best cake they have ever ate. My son loves it too. 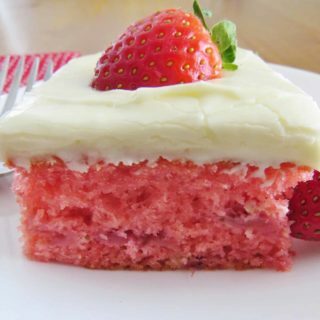 I put a cup and a half of strawberries in the cake. I use a block of cream cheese in the icing and no milk. I slice fresh strawberries for the top of cake too. 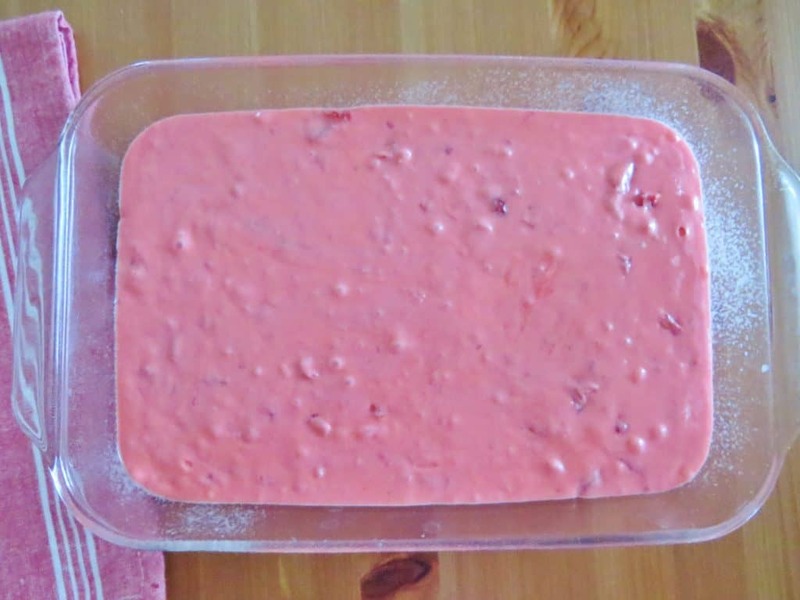 I made this with a strawberry cake mix and left out the jello. Came out delicious. Also, you have to double the frosting recipe or there is not enough. 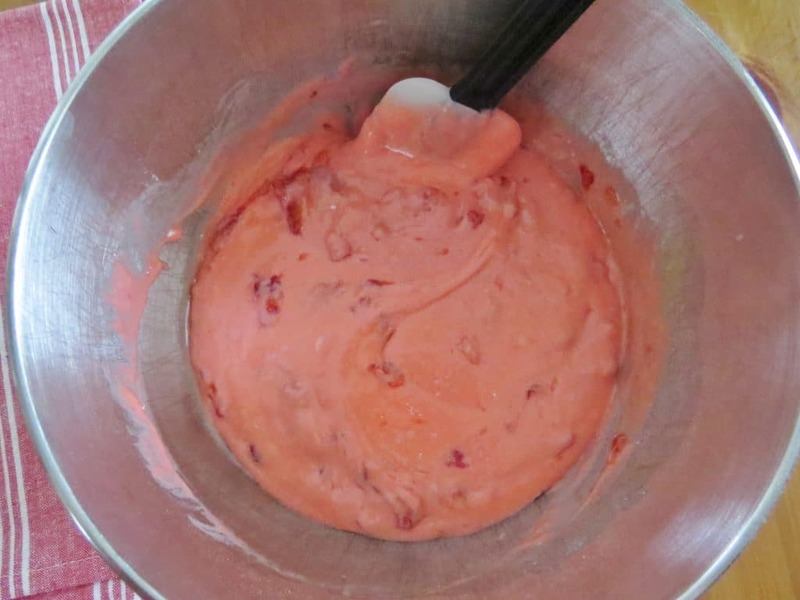 In oven now but made with strawberry cake mix and blended frozen strawberries and followed the rest exactly. . Time will only tell now…… Will update here shortly.